Granted it may be August 1st and Spring is on the distant horizon, but it’s still gosh-darned chilly where this writer is tapping away from, and she’s longing for warmer days. Luckily, Jamie and Jools Oliver are here to help. They’re sharing some highlights from their recent family holiday with kiddos 15-year-old Poppy, 14-year-old Daisy Boo, 8-year-old Petal, 6-year-old Buddy and 11-month-old River. 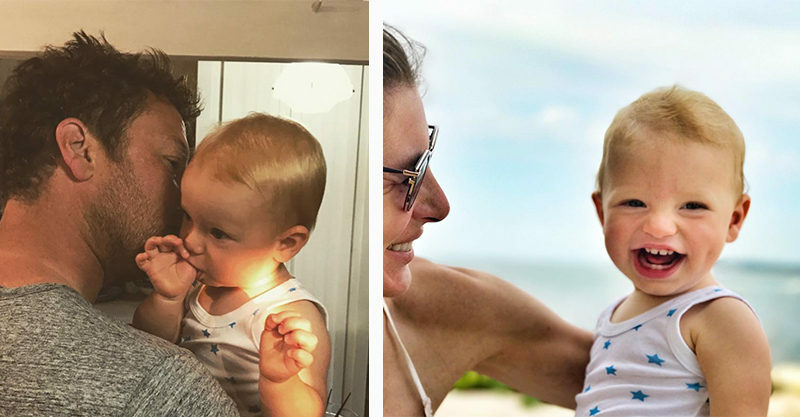 If you stare at these pictures for long enough, you can imagine yourself as baby Oliver number 6, soaking up the sunshine, breathing in the sea air and wiggling your baby Oliver toes in the sand. Ahhh. The other thing canny types will notice, as you scroll through, is that the pics of Jools and kiddos are few and far between. (Sound familiar?!) A few pop up on their Instagram accounts – like the one below – but overall they’re kind of thin on the ground. It’s a typical mum thing, really and it must be remedied! If we can’t get the Olivers to mum up a bit more, photographically, than we can at least start in our own backyards, right?! Hop to it, mums and others! That said, we’re super glad they share anything, really. Not only is it a delight to catch a glimpse of this big and gorgeous family in full flight, it’s deliciously inspiring to see what they’re eating as they navigate what looks like a mixed-up and fun-filled life. Now let’s take a delightful scroll through Jamie and Jools’ lovely Summer holiday. We totally wish we were there!